For other uses, see Quanzhou (disambiguation). Not to be confused with Guangzhou. Quanzhou, formerly known as Chinchew, is a prefecture-level port city on the north bank of the Jin River, beside the Taiwan Strait in Fujian Province, People's Republic of China. It is Fujian's largest metropolitan region, with an area of 11,245 square kilometers (4,342 sq mi) and, as of 2010, a population of 8,128,530. Its built-up area is home to 6,107,475 inhabitants, encompassing the Licheng, Fengze, and Luojiang urban districts; Jinjiang, Nan'an, and Shishi cities; Hui'an County; and the Quanzhou District for Taiwanese Investment. 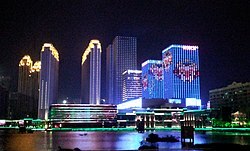 Quanzhou was China's 12th-largest extended metropolitan area in 2010. Quanzhou was China's major port for foreign traders, who knew it as Zaiton,[a] during the 11th through 14th centuries. It was visited by both Marco Polo and Ibn Battuta; both travelers praised it as one of the most prosperous and glorious cities in the world. It was the naval base from which the Mongol attacks on Japan and Java were primarily launched and a cosmopolitan center with Buddhist and Hindu temples, Islamic mosques, and Christian churches, including a Catholic cathedral and Franciscan friaries. A failed revolt prompted a massacre of the city's foreign communities in 1357. Economic dislocations—including piracy and an imperial overreaction to it during the Ming and Qing—reduced its prosperity, with Japanese trade shifting to Ningbo and Zhapu and other foreign trade restricted to Guangzhou. Quanzhou became an opium-smuggling center in the 19th century but the siltation of its harbor hindered trade by larger ships. Quanzhou is the atonal pinyin romanization of the city's Chinese name 泉州, using its pronunciation in the Mandarin dialect. The name derives from the city's former status as the seat of the imperial Chinese Quan ("Spring") Prefecture. Ch'üan-chou was the Wade-Giles romanization of the same name; other forms include Chwanchow-foo, Chwan-chau fu, Chwanchew, Ts'üan-chou, Tswanchow-foo, Tswanchau, T'swan-chau fu, Ts'wan-chiu, Ts'wan-chow-fu, Thsiouan-tchéou-fou, and Thsíouan-chéou-fou. The romanizations Chuan-chiu, Choan-Chiu, and Shanju reflect the local Hokkien pronunciation. The Postal Map name of the city was "Chinchew", a variant of Chincheo, the Portuguese and Spanish transcription of the local Hokkien name for Zhangzhou,[b] the major Fujianese port trading with Macao and Manila in the 16th and 17th centuries. It is uncertain when or why British sailors first applied the name to Quanzhou. The city features a humid subtropical climate. Quanzhou has four distinct seasons. Its moderate temperature ranges from 0 to 38 degrees Celsius. In summer, there are typhoons that bring rain and some damage to the city. Major earthquakes have been experienced in 1394 and on 29 December 1604. 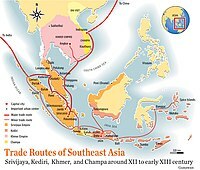 Trade routes in Southeast Asia during Quanzhou's heyday. Wang Guoqing (王國慶) used the area as a base of operations for the Chen State before he was subdued by the Sui general Yang Su in the AD 590s. Quanzhou proper was established under the Tang in 718 on a spit of land between two branches of the Jin River. Muslim traders reached the city early on in its existence, along with their existing trade at Guangzhou and Yangzhou. Already connected to inland Fujian by roads and canals, Quanzhou grew to international importance in the first century of the Song. It received an office of the maritime trade bureau in 1079 or 1087 and functioned as the starting point of the Maritime Silk Road into the Yuan, eclipsing both the overland trade routes and Guangzhou. A 1095 inscription records two convoys, each of twenty ships, arriving from the Southern Seas each year. Quanzhou's maritime trade developed the area's ceramics, sugar, alcohol, and salt industries. Ninety per cent of Fujian's ceramic production at the time was jade-colored celadon, produced for export. Frankincense was such a coveted import that promotions for the trade superintendents at Guangzhou and Quanzhou were tied to the amount they were able to bring in during their terms in office. During this period it was one of the world's largest and most cosmopolitan seaports. [d] By 1120, its prefecture claimed a population of around 500,000. Its Luoyang Bridge was formerly the most celebrated bridge in China and the 12th century Anping Bridge is also well known. Quanzhou initially continued to thrive under the Southern Song produced by the Jin–Song Wars. A 1206 report listed merchants from Arabia, Iran, the Indian subcontinent, Sumatra, Cambodia, Brunei, Java, Champa, Burma, Anatolia, Korea, Japan and the city-states of the Philippines. One of its customs inspectors, Zhao Rugua, completed his compendious Description of Barbarian Nations c. 1225, recording the people, places, and items involved in China's foreign trade in his age. Other imperial records from the time use it as the zero mile for distances between China and foreign countries. Tamil merchants carved idols of Vishnu and Shiva and constructed Hindu temples in Quanzhou. Over the course of the 13th century, however, Quanzhou's prosperity declined due to instability among its trading partners and increasing restrictions introduced by the Song in an attempt to restrict the outflow of copper and bronze currency from areas forced to use hyperinflating paper money. The increasing importance of Japan to China's foreign trade also benefited Ningbonese merchants at Quanzhou's expense, given their extensive contacts with Japan's major ports on Hakata Bay on Kyushu. Under the Mongolian Yuan dynasty, a superintendent of foreign trade was established in the city in 1277, along with those at Shanghai, Ningbo, and Guangzhou. The former Song superintendent Pu Shougeng, an Arab or Persian Muslim, was retained for the new post, using his contacts to restore the city's trade under its new rulers. He was broadly successful, restoring much of the port's former greatness, and his office became hereditary in his descendants. Into the 1280s, Quanzhou sometimes served as the provincial capital for Fujian. [e] Its population was around 455,000 in 1283, the major items of trade being pepper and other spices, gemstones, pearls, and porcelain. Marco Polo recorded that the Yuan emperors derived "a vast revenue" from their 10% duty on the port's commerce; he called Quanzhou's port "one of the two greatest havens in the world for commerce" and "the Alexandria of the East". Ibn Battuta simply called it the greatest port in the world. [f] Polo noted its tattoo artists were famed throughout Southeast Asia. It was the point of departure for Marco Polo's 1292 return expedition, escorting the 17-year-old Mongolian princess Kököchin to her fiancé in the Persian Ilkhanate; a few decades later, it was the point of arrival and departure for Ibn Battuta. [g] Kublai Khan's invasions of Japan and Java sailed primarily from its port. The Islamic geographer Abulfeda noted, in c. 1321, that its city walls remained ruined from its conquest by the Mongols. In the mid-1320s, Friar Odoric noted the town's two Franciscan friaries, but admitted the Buddhist monasteries were much larger, with over 3000 monks in one. In 1357, the Shiite Muslim garrison undertook the Ispah Rebellion against the Yuan and their local Sunni Muslim leadership. By 1362, they controlled the countryside as far as the outskirts of Fuzhou, but after a defeat by the Yuan there they retreated to Quanzhou. There, their leaders were killed by Nawuna, a descendant of Pu Shougeng, who was killed in turn by Chen Youding. Chen began a campaign of persecution against the city's Sunni community—including massacres and grave desecration—that eventually became a three days of anti-foreign massacre. Emigrants fleeing the persecution rose to prominent positions throughout Southeast Asia, spurring the development of Islam on Java and elsewhere. The Yuan were expelled in 1368. In the 19th century, the city walls still protected a circuit of 7–8 miles (11–13 km) but embraced much vacant ground. The bay began to attract Jardines' and Dents' opium ships from 1832. Following the First Opium War, Governor Henry Pottinger proposed using Quanzhou as an official opium depot to keep the trade out of Hong Kong and the other treaty ports but the rents sought by the imperial commissioner Qiying were too high. When Chinese pirates overran the receiving ships in Shenhu Bay to capture their stockpiles of silver bullion in 1847, however, the traders moved to Quanzhou Bay regardless. Around 1862, a Protestant mission was set up in Quanzhou. As late as the middle of the century, large Chinese junks could still access the town easily, trading in tea, sugar, tobacco, porcelain, and nankeens, but sand bars created by the rivers around the town had generally incapacitated its harbor by the First World War. It remained a large and prosperous city, but conducted its maritime trade through Anhai. 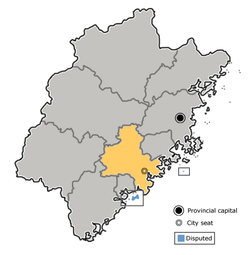 The prefecture-level city of Quanzhou administers four districts, three county-level cities, four counties, and two special economic districts. The People's Republic of China claims Jinmen County, more widely known as Kinmen County, as part of Quanzhou, but the territory is currently under the jurisdiction of the Republic of China. is claimed by the PRC. *: Since its founding in 1949, the People's Republic of China ("Mainland China") has claimed the Jinmen Islands as part of Quanzhou but has never controlled them. They are presently administered as the Kinmen County of the Republic of China ("Taiwan"). Medieval Quanzhou was long one of the most cosmopolitan Chinese cities, with folk, Buddhist, and Hindu temples; Islamic mosques; and Christian churches, including Nestorian and a cathedral (financed by a rich Armenian lady) and two Franciscan friaries. Andrew of Perugia served as the Roman Catholic bishop of the city from 1322. Odoric of Pordenone was responsible for relocating the relics of the four Franciscans martyred at Thana in India in 1321 to the mission in Quanzhou. English Presbyterian missionaries raised a chapel around 1862. The Qingjing Mosque dates to 1009 but is now preserved as a museum. The Buddhist Kaiyuan Temple has been repeatedly rebuilt but includes two 5-story 13th-century pagodas. Among the most popular folk or Taoist temples is that to Guandi (关帝庙), the war god who is honored for his control of weather and wealth. Jinjiang also preserves the Cao'an Temple (草庵寺), originally constructed by Manicheans under the Yuan but now used by New Age spiritualists, and a Confucian Temple (文庙, Wenmiao). Locals speak the Quanzhou variety of Min Nan essentially the same as the Amoy dialect spoken in Xiamen, and similar to South East Asian Hokkien and Taiwanese. It is unintelligible with Mandarin. Many overseas Chinese whose ancestors came from the Quanzhou area, especially those in Southeast Asia, often speak mainly Hokkien at home. Around the "Southern Min triangle area," which includes Quanzhou, Xiamen and Zhangzhou, locals all speak Minnan languages. The dialects they speak are similar but have different intonations. Quanzhou has been a source for Chinese emigration to Southeast Asia and Taiwan. Some of these communities date to Quanzhou's heyday a millennium ago under the Song and Yuan dynasties. About 6 million overseas Chinese trace their ancestry to Quanzhou and Tong'an county. Most of them live in Taiwan or Southeast Asian countries, including Singapore, the Philippines, Malaysia, Indonesia, Burma, and Thailand. Historically, Quanzhou exported black tea, camphor, sugar, indigo, tobacco, ceramics, cloth made of grass, and some minerals. They imported, primarily from Guangzhou, wool cloth, wine, and watches, as of 1832. As of that time, the East India Company was exporting an estimated ₤150,000 a year in black tea from Quanzhou. Quanzhou is a major exporter of agricultural products such as tea, banana, lychee and rice. It is also a major producer of quarry granite and ceramics. Other industries include textiles, footwear, fashion and apparel, packaging, machinery, paper and petrochemicals. Quanzhou is the biggest automotive market in Fujian; it has the highest rate of private automobile possession. Its GDP ranked first in Fujian Province for 20 years, from 1991 to 2010. In 2008, Quanzhou's textile and apparel production accounted for 10% of China's overall apparel production, stone exports account for 50% of Chinese stone exports, resin handicraft exports account for 70% of the country's total, ceramic exports account for 67% of the country's total, candy production accounts for 20%, and the production of sport and tourism shoes accounts for 80% of Chinese, and 20% of world production. Because of this, Quanzhou is known today as China's "shoe city." Quanzhou's 3,000 shoe factories produce 500 million pairs a year, making nearly one in every four pairs of sneakers made in China. Different districts and counties in Quanzhou have their own special industries which are known to the rest of China. Jinjiang and Shishi are famous for apparel and textiles, Huian is famous for its stone, Quangang is famous for petrifaction, Dehua for Ceramics, Yongchun for Citrus, Anxi for wulong tea, Nan An for building materials, and Fengze for resin. Quanzhou is an important transport hub within southeastern Fujian province. Many export industries in the Fujian interior cities will transport goods to Quanzhou ports. Quanzhou Port was one of the most prosperous port in Tang Dynasty while now still an important one for exporting. Quanzhou is also connected by major roads from Fuzhou to the north and Xiamen to the south. There is a passenger ferry terminal in Shijing, Nan'an, Fujian, with regular service to the Shuitou Port in the ROC-controlled Kinmen Island. Quanzhou Jinjiang International Airport is Quanzhou region's airport, served by passenger flights within Fujian province and other destinations throughout the country. Quanzhou has two kinds of railway service. The Zhangping–Quanzhou–Xiaocuo Railway, a "conventional" rail line opened ca. 2001, connects several cargo stations within Quanzhou Prefecture with the interior of Fujian and the rest of the country. Until 2014, this line also had passenger service, with fairly slow passenger trains from Beijing, Wuhan, and other places throughout the country terminating at the Quanzhou East Railway Station, a few kilometers northeast of the center of the city. Passenger service on this line was terminated, and Quanzhou East Railway Station closed on December 9, 2014. Since 2010, Quanzhou is served by the high-speed Fuzhou–Xiamen Railway, part of the Hangzhou–Fuzhou–Shenzhen High-Speed Railway, which runs along China's southeastern sea coast. High-speed trains on this line stop at Quanzhou Railway Station (in Beifeng Subdistrict of Fengze District, some 10 miles north of Quanzhou city center) and Jinjiang Railway Station. Trains to Xiamen take under 45 minutes, making it a convenient weekend or day trip. By 2015, direct high-speed service has become available to a number of cities in the country's interior, from Beijing to Chongqing and Guiyang. Long-distance bus services also run daily/nightly to Shenzhen and other major cities. The city hosted the Sixth National Peasants' Games in 2008. Signature local dishes include rice dumplings and oyster omelettes. Qing Yuan mountain (清源山) - The tallest hill within the city limits, which hosts a great view of West lake. East Lake Park (东湖) - Located in the city center. It is home to a small zoo. West Lake Park (西湖公园) - The largest body of fresh water within the city limits. Scholar Street (状元街) - Champion street about 500 meters long, elegant environment, mainly engaged in tourism and cultural crafts. Fengze Square - Located in the city center and acts as a venue for shows and events. Dapingshan - The second tallest hill within the city limits, crowned with an enormous equestrian statue of Zheng Chenggong. Relics from Quanzhou's past are preserved at the Maritime or Overseas-Relations History Museum. It includes large exhibits on Song-era ships and Yuan-era tombstones. A particularly important exhibit is the so-called Quanzhou ship, a seagoing junk that sunk some time after 1272 and was recovered in 1973–74. The old city center preserves "balcony buildings" (骑楼, qilou), a style of southern Chinese architecture from the Republican Era. Li Nu, son of Li Lu, visited Hormuz in Persia in 1376, converted to Islam, married a Persian girl, and brought her back to Quanzhou. Li Nu was the ancestor of the Ming reformer Li Chih. The Ding or Ting family of Chendai in Quanzhou claims descent from the Muslim leader Sayyid Ajjal Shams al-Din Omar through his son Nasr al-Din or Nasruddin (Chinese: Nasulading). The Dings have branches in Taiwan, the Philippines, and Malaysia among the Chinese communities there, no longer practicing Islam but still maintaining a Hui identity. The deputy secretary-general of the Chinese Muslim Association on Taiwan, Ishag Ma (馬孝棋) has claimed "Sayyid is an honorable title given to descendants of the Prophet Mohammed, hence Sayyid Shamsuddin must be connected to Prophet Mohammed". The Ding family in Taisi Township in Yunlin County of Taiwan, traces descent from him through the Ding of Quanzhou in Fujian. Nasruddin was appointed governor in Karadjang and retained his position in Yunnan till his death, which Rashid, writing about 1300, says occurred five or six years before. (According to the History of Yuan, "Nasulading" died in 1292.) Nasruddin's son Abubeker, who had the surname Bayan Fenchan (evidently the Boyen ch'a-r of the Yüan shi), was governor in Zaitun at the time Rashid wrote. He bore also his grandfather's title of Sayid Edjell and was Minister of Finance under Kublai's successor. Nasruddin is mentioned by Marco Polo, who styles him "Nescradin". ^ Zaiton's identification with Quanzhou was controversial in the 19th century, with some scholars preferring to associate Polo and Ibn Battuta's great port with the much more attractive harbor at Xiamen on a variety of pretexts. The Chinese records are, however, clear as to Quanzhou's former status and the earlier excellence of its harbor, which slowly silted up over the centuries. ^ Zhangzhou itself is named for its former status as the seat of the imperial Chinese Zhang River Prefecture. ^ "Satin" actually derives via French from the Italian adjective setino ("silken") derived from Latin sētā ("silk"). ^ Among other testaments to this age are tombstones which have been found written in Chinese, Arabic, Syriac, and Latin. ^ It was considered so important by the Jesuits that they sometimes called all of Fujian Chinheo. In 1515, Giovanni d'Empoli mistakenly recorded that "Zeiton" was the seat of the "Great Can" who ruled China but Quanzhou never served as an imperial capital. ^ Notwithstanding the derivation of Zayton from Quanzhou's old nickname "City of the Tung Trees", some details of Ibn Battuta's description suggest he was referring to Zhangzhou. ^ Quanzhou was also the probable point of departure for the Franciscan friar John of Marignolli around the same time but this is uncertain given the partial nature of the record of his time in China. ^ 泉州市2009年国民经济和社会发展统计公报 (in Chinese). Quanzhou Municipal Statistic Bureau. 2010-03-08. Retrieved 2010-05-03. ^ The Cambridge History of China, Vol. VI, Cambridge: Cambridge University Press, 1994 . ^ Long So Kee (1991), "Financial Crisis and Local Economy: Ch'üan-chou in the Thirteenth Century", T'oung Pao, No. 77, pp. 119–37 . ^ a b c d e f g h Yule & Cordier (1920), p. 237. ^ a b Yule & Cordier (1920), p. 617. ^ a b c d e Yule & Cordier (1920), p. 238. ^ a b c Gibb (1929), p. 8. ^ Pitcher, Philip Wilson (1893), Fifty Years in Amoy or A History of the Amoy Mission, China, New York: Reformed Church in America, p. 33 . ^ Abulfeda, Geography, recorded by Cordier. ^ Postal Atlas of China. ^ a b c d e f g h Allaire, Gloria (2000), "Zaiton", Trade, Travel, and Exploration in the Middle Ages: An Encyclopedia, Abingdon: Routledge . ^ Goodrich, L. Carrington (1957), "Recent Discoveries at Zayton", Journal of the American Oriental Society, No. 77, pp. 161–5 . ^ a b Schottenhammer (2010), p. 145. ^ a b c Yule & Cordier (1920), p. 234. ^ Tellier, Luc-Normand (2009), Urban World History: An Economic and Geographical Perspective, Quebec: University of Quebec Press, p. 221, ISBN 978-2-7605-1588-8 . ^ As in the Encyclopædia Britannica and in Tellier. ^ a b "satin, n. (and adj. )", Oxford English Dictionary, Oxford: Oxford University Press, 1909 . ^ "Yang Su 楊素 (544–606), zi Chudao 處道", Ancient and Early Medieval Chinese Literature, Vol. III, Leiden: Brill, 2014, p. 1831 . ^ Schottenhammer (2010), p. 117. ^ a b c d e f Von Glahn, Richard, The Economic History of China: From Antiquity to the Nineteenth Century, p. 394 . ^ Wade (2015), p. 81. ^ Ye Yiliang (2010), "Introductory Essay: Outline of the Political Relations between Oman (Thailand) and China", Aspects of the Maritime Silk Road: From the Persian Gulf to the East China Sea, East Asian Maritime History, Vol. 10, Wiesbaden: Harrassowitz Verlag, p. 5 . ^ Pearson, Richard; Li Min; Li Guo (2001), "Port, City, and Hinterlands: Archaeological Perspectives on Quanzhou and its Overseas Trade", The Emporium of the World: Maritime Quanzhou, 1000–1400, Sinica Leidensia, Vol. 49, Brill, p. 192, ISBN 90-04-11773-3 . ^ Schottenhammer (2010), p. 130. ^ Bowman, John, "China", Columbia Chronologies of Asian History and Culture, p. 32 . ^ a b c d e Yule & Cordier (1920), p. 239. ^ Chow Chung-wah (7 September 2012), "Quanzhou: China's Forgotten Historic Port", CNN Travel, Atlanta . ^ Krishnan, Ananth (19 July 2013), "Behind China's Hindu temples, a Forgotten History", The Hindu . ^ Schottenhammer, Angela (2001), "The Role of Metals and the Impact of the Introduction of Huizi Paper Notes in Quanzhou on the Development of Maritime Trade in the Song Period", The Emporium of the World: Maritime Quanzhou, 1000–1400, Sinica Leidensia, Vol. 49, Brill, pp. [https://books.google.com/books?id=GEhGM6fZeaAC&pg=PA153 153 ff, ISBN 90-04-11773-3 . ^ a b c Wade, Geoff (2015), "Chinese Engagement with the Indian Ocean during the Song, Yuan, and Ming Dynasties (Tenth to Sixteenth Centuries)", in Pearson, Michael (ed. ), Trade, Circulation, and Flow in the Indian Ocean World, Palgrave Series in Indian Ocean World Studies, Basingstoke: Palgrave Macmillan, p. 72 . ^ a b c Wade, Geoff (2012), "Southeast Asian Islam and Southern China in the Fourteenth Century", Anthony Reid and the Study of the Southeast Asian Past, Singapore: Institute of Southeast Asian Studies, pp. 131 ff . ^ Wade (2015), p. 73. ^ a b c Yule & Cordier (1920), p. 235. ^ a b c d e f g h i j CNN, By Ramy Inocencio, for. "Could world's tallest building bring China to its knees? - CNN.com". Retrieved 29 October 2016. ^ Yule & Cordier (1920). ^ Rossabi, Morris, The Mongols: A Very Short Introduction, p. 111 . ^ Sen Tan Ta Dasheng, Chen (2009), Cheng Ho and Islam in Southeast Asia, Institute of Southeast Asian Studies, p. 186, ISBN 9789812308375 . ^ a b c Nield, Robert, China's Foreign Places: The Foreign Presence in China in the Treaty Port Era..., p. 68 . ^ Stephan Feuchtwang. Making Place: State Projects, Globalisation and Local Responses in China. p. 41. ^ Kauz, Ralph (2010), "A Kāzarūnī Network? ", Aspects of the Maritime Silk Road: From the Persian Gulf to the East China Sea, East Asian Maritime History, Vol. 10, Wiesbaden: Harrassowitz Verlag, p. 65 . ^ Wade (2015), p. 68. ^ Association for Asian studies (Ann Arbor; Michigan) (1976), A-L, Vols. 1-2, New York: Columbia University Press, p. 817, ISBN 9780231038010 . ^ Chen, Da-Sheng. "Chinese-Iranian Relations, VII: Persian Settlements in Southeastern China during the T'ang, Sung, and Yuan Dynasties". Encyclopedia Iranica. Retrieved 28 June 2010. ^ Needham, Joseph (1971). Science and Civilisation in China, Vol. 4. Cambridge: Cambridge University Press. p. 495. ISBN 9780521070607. ^ Schottenhammer (2008), p. 123. ^ Loa Iok-Sin / STAFF REPORTER (August 31, 2008). "FEATURE : Taisi Township re-engages its Muslim roots". Taipei Times. p. 4. Retrieved May 29, 2011. ^ D'Ohsson, tom. ii, pp. 476, 507, 508. ^ vol. ii, p. 66. ^ Journal of the North-China Branch of the Royal Asiatic Society, New Series, Vol. X. Shanghai: Royal Asiatic Society of Great Britain and Ireland, North-China Branch. 1876. p. 122. ^ Bretschneider, E. (1876). Notices of the Mediaeval Geography and History of Central and Western Asia. London: Trübner & Co. p. 48. Ibn Battúta (1929), Gibb, H.A.R. ; Eileen Power; E. Denison Ross (eds. ), Travels in Asia and Africa, The Broadway Travellers, Routledge & Kegan Paul, Book II, Ch. XI . Schottenhammer, Angela (2008), The East Asian Mediterranean: Maritime Crossroads of Culture, Commerce, and Human Migration, Otto Harrassowitz Verlag, ISBN 3-447-05809-9 . Schottenhammer, Angela (2010), "Transfer of Xiangyao 香藥 from Iran and Arabia to China: A Reinvestigation of Entries in the Youyang Zazu 酉陽雜俎 (863)", Aspects of the Maritime Silk Road: From the Persian Gulf to the East China Sea, East Asian Maritime History, Vol. 10, Wiesbaden: Harrassowitz Verlag, p. 145 . Marco Polo (1903), "Of the City and Great Haven of Zayton", in Yule, Henry (ed. ), The Book of Ser Marco Polo the Venetian Concerning the Kingdoms and Marvels of the East, 3rd ed., Vol. II , annotated by Henri Cordier in 1920, London: John Murray. Brown, Bill (2004), Mystic Quanzhou: City of Light, Xiamen: Xiamen University Press . 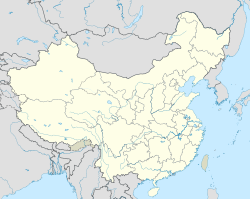 Wikimedia Commons has media related to Quanzhou. Wikivoyage has a travel guide for Quanzhou.